Dr Martin De Saulles, Principal Lecturer on our computing courses, has published a book on a rapidly developing area of the computing and communications sectors which “has the potential to change how we live and work”. 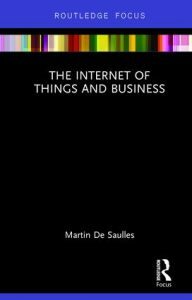 Dr De Saulles explores the business models emerging from the IoT and considers the challenges as well as the opportunities they pose to businesses around the world. Find out more about Dr De Saulles book here. This entry was posted in Digital media, Life at Brighton, Research, Uncategorized.